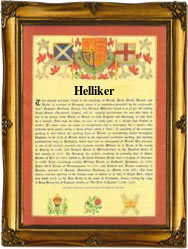 This unusual and interesting surname, recorded as Helliker, Hellicar, and Hilliker, is of Ancient British origins. It may be either a topographical or a locational surname. If the former, the surname denotes residence at or by "a holy stone", derived from the Old English pre 7th Century "haelig" meaning holy, and the suffix "carr", a rock or stone. Such a particular rock might be called "holy" through association with a saint or notable holy man, or because it was used as a meeting place or a sacrificial altar during religious gatherings. The surname can also be locational from a place formerly named "Haelig-carr" which has now totally disappeared, but is thought to have been situated in Somerset. This is not in itself unusual. At least seven thousand British villages and hamlets have been "lost" since the 14th Century, mainly due to enforced "clearing" of lands for sheep pasture, but also as a result of plague, civil war, and emparking. Examples of the surname recordings include Nicholas Hellicar who married Elizabeth Stockham on the 15th of January 1679 at East Quantoxhead in Somerset. The first recorded spelling of the family name is shown to be that of Richard Hellaker, which was dated October 9th 1636, christened at Wiveliscombe, Somerset, during the reign of King Charles I, known as "The Martyr", 1625 - 1649. Surnames became necessary when governments introduced personal taxation. In England this was known as Poll Tax. Throughout the centuries, surnames in every country have continued to "develop" often leading to astonishing variants of the original spelling.